By the end of year one, most kids can recite classic nursery rhymes like Jack and Jill or London Bridge. They’re fun, easy, and comfortably familiar. Here’s a silly game to draw on that knowledge while introducing a concept that will be a big part of year two reading and writing: learning about nouns and verbs. Explain to your child that this is a game that uses a “big” idea from first and year three: the difference between nouns and verbs. 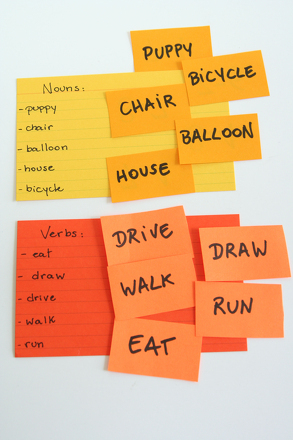 In year two terms: nouns are words that show people, places, and things; and verbs are words that show actions. Brainstorm two sets of cards: one for nouns, and one for verbs. If you’ve got older siblings around, invite them to help, but do make sure that your first grader is familiar with all of the words you’re putting down! If this is the first time you’ve ever discussed nouns and verbs, make sure you do a little “checkup” before you go further. Pull out random cards, and read out the word. What is “run”? A noun or a verb? How about “bicycle”? Make sure your child knows the difference. Now remind your kid about familiar nursery rhymes, such as “Row, Row, Row your boat, gently down the stream…” Start by pointing out one nouns, such as “stream.” Now pull out a noun card, and have your child use it instead of “stream.” If you’ve got friends or siblings on hand, invite them to do the same, and compare answers. Remember: first graders think concretely. So when you end up with “Row, row, row your boat, gently down the garbage can,” you can expect happy, silly guffaws. Now do another rhyme, perhaps “Jack and Jill,” or “London Bridge,” but replace a few verbs instead! Special Note: Real “Mad Libs” are generally written for third graders and above, and they include not just nouns and verbs but adjectives, adverbs, and so on. Beware: these are usually too complex for first graders. For this age, it's recommend that you change only one word per line, so that the contrast between the old meaning and the new one is especially clear. “Nursery Rhyme” versions are meant to keep things simple, direct, and above all, really delightful for the whole family. What was the very first toy you played with when you were a baby? Answer this question and more by filling in the blanks to answer the questions about toys.